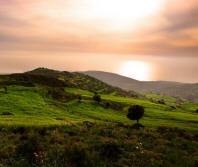 Cyprus adventure- Sightseeing Excursions from Limassol. A trip to remember to the Blue Lagoon. A day with an Aphrodite theme. We pick you up at 8am in Limassol. On the way to The Akamas Peninsula, you will visit the Rock of Aphrodite, the famous Birthplace of Aphrodite – ancient legend says that the Greek Goddess of Love came out of the waters here. On to Latchi harbour where you will board the Boat for a day of sightseeing, relaxation, and swimming. We will visit the famous Fontana Amorosa or the Fountain of Love, named by the Italian poet Ludovico Ariosto (1474 - 1533) which is said to be where Aphrodite drank. Then we will stop at the most popular bay in Cyprus – Blue Lagoon, famous for its beautiful white sandy bottom and blue crystal waters. Complimentary Wine, Juice, Fruit, and Snorkeling equipment will be offered on-board. We will then head towards The Baths of Aphrodite, the natural pool, surrounded with greenery – where Aphrodite bathed. Cyprus legend has it that if you immerse yourself in the pool, you will always stay beautiful. We will then stop for lunch at a traditional beach Restaurant. Lunch is optional and is not included in the price. Lastly, we will visit the banana plantations and stop, at the incredibly beautiful sea caves. Please remember Need to bring: Swimming suit, towel, comfortable footwear. This excursion runs on; Tuesdays and Fridays from May to November. The first stop on today's trip will be at the viewpoint of the Ghost Town of the Varosha section of the town of Famagusta. Prior to the Turkish invasion in 1976, this was one of the world’s best-known tourist resorts with its golden sand beaches and modern high rise architecture. Now it is a ghost town, empty, eerie and overgrown. Next We will take a walk in the charming old town of Famagusta, where you will see the walls of the city, the Othello Tower and St Nicholas' Gothic Church, which is now a mosque. A beautiful and grand sight. You will be asked to remove your shoes should you wish to admire it from the inside. Then we will visit the Bellapais Abbey of the 14th century – a masterpiece of Gothic art and an architectural monument of world importance. Next we visit the town of Kyrenia , where you may see Kyrenia castle. You can observe the impact of many different historical periods – Byzantine, Lusignan and Venetian as well as enjoy the beautiful surroundings of the old harbor near which the castle is situated. We will stop for lunch in the area. Lunch is optional and is not included in the price. Passing by the Capital city Nicosia and the infamous Green Line, we will return to Limassol by around 5 pm. **You must bring your passport with you as you will be going abroad. This excursion runs on; Mondays from May to November. We commence the excursion in Lefkara the home of Cyprus lace making industry for hundreds of years, we will visit the 'House of Lefkaritika Lace and silver handicrafts'. Here you will learn about the history of the best known Cypriot lace and embroidery and see some extraordinary pieces of art. We will then drive through many beautiful villages in the countryside, before we stop for a coffee break at Astromeritis on the green line. Next, we will head up to the Troodos Mountains, where we will visit Kykkos Monastery – the island’s most prosperous and opulent Orthodox monastery. Dedicated to the Virgin Mary, the monastery possesses one of the three icons attributed to Apostle Luke the Evangelist. After this we will drive to the highest peak on the islands top at Mount Olympus (1951 m). We will make a stop at a pretty mountain village, where you will have an opportunity to taste a traditional mountain Meze of home cooked meat. Meze and local wine lunch is optional and is not included in the price. We move on to a Winery where we will enjoy wines produced from local grapes which grow on the island’s best grape producing region, the A Zone, on the southern slopes of the Troodos Mountain range. Our last stop of the day will be at Omodos village, where we will visit the Monastery of the Holy cross, Timios Stavros Church, which according to tradition, was established before St. Helen's arrival in Cyprus in 327 AD. This excursion runs on; Monday, Wednesday and Saturday from May to November. and Monday and Saturday from December to April. Seven sleepers, St Paul's pillar and Dionysus. Today's excursion will be to discover the ancient city of Curium/Kourion with its magnificent Greco Roman Theatre and buildings of the late roman period. See the beautiful mosaics. Swim at the Birthplace of Aphrodite the Goddess of Love and Beauty. Walk through the caves and Catacombs of the legendary St.
See The Pillar of St. Paul, where he was bound and lashed as a punishment for preaching Christianity. From the Old Port area of the Venetian Fort in Paphos, you will have free time to discover the nearby Archeological city – Kato Pafos which is included in the UNESCO World Heritage Sites. Here you will find the House of Dionysus, with the finest mosaic decorations of mythological compositions dating back to the second century A.D.
You can then enjoy lunch at one of the many attractive restaurants in the Old Port. Lunch is optional and is not included in the price. On the way back, we will stop at Yeroskipou Village, where we shall taste the famous Cyprus Delights of “Loukoumia”. Tuesdays and Thursdays from May to November. We will start our safari with a visit to the old Korfi Village that was destroyed by a landslide and have a look in the Chrisokorfidisa Church. Nearby we will enjoy a walk around the little village of Kapileio..
Next, we visit Omodos village, where you can see The church of the Holy cross, Timios Stavros and explore the local souvenir shops. You will be able to sample different local wines from this famous wine producing area. 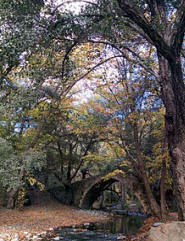 We will then visit the Medieval/Venetian Kelefos Bridge, hidden deep within the mountains, which connected two parts of Cyprus many years ago (please wear comfortable shoes). Afterwards, we will drive off-road towards the largest and richest active monastery in Cyprus – The Kykkos Byzantine Monastery. Dedicated to the Virgin Mary, it holds her icon painted by St. Luke. We will then reach the highest peak on the island – Mount Olympus at 1950 meters. Next, we will stop for lunch at a traditional Village Tavern to enjoy a homemade Cyprus meze, accompanied with local wine. Lunch is optional and is not included in the price. Lastly, we will visit the hidden waterfall of Millomeri, one of the largest on the island. Passing the Alassa dam, the biggest dam in Cyprus on our way home, where we will end the safari. This excursion runs on; Wednesday (and as a combination on Saturday ) from May to November. Sunbathe and swim at one of the best white-sand beaches on the island! Our first stop will be at the Bridge of Love. The ancient legend tells that if you kiss at this bridge, your love will become eternal or you will find your true love very soon after visiting it! We will then discover Cape Greco, at the southern end of Famagusta Bay, famous for its sea caves and spectacular views. Here you may visit the charming Agioi Anargyroi chapel, built on the edge of the rocky cliffs overlooking the sea. Our next stop will be in Agia Napa! Here you will have plenty of time for swimming and relaxation on the beautiful white sand of the famous Nissi Beach. You can spend the time at your leisure and visit the main popular tourist street for lunch and shopping. Cross the Green Line in the divided city and stroll down the promenade of Larnaca. If you are staying in Limassol, Take a trip to the Capital of Cyprus – NICOSIA. Here you will visit the Archbishops Palace, which saw much fighting during the 1974 invasion and see St John's Cathedral, within it's courtyard. We will then go to the Laiki Yitonia (Peoples quarter) and walk through a traditional neighborhood of Nicosia with narrow winding streets, cafes and craft shops. In the Leventis municipal museum, you can view many historical objects from the town and the Island. Arriving at the liveliest part of the old city- Ledra street where you can enjoy some free time for souvenir shopping and the opportunity, if you would like, to *cross over to the Turkish occupied side of Cyprus. Next, we will drive down to the coast and Larnaca, where you will see the the church of Ayios Lazarus – one of the finest examples of Byzantine architecture anywhere. On the Palm Tree sea front , known as Phinikoudes, you will again have free time to visit cafes and restaurants, stroll down the pier or paddle on the sandy shore. We will then drive back to Limassol to arrive at around 5pm. as you will be going abroad. This excursion runs on; Thursdays from May to November. and Fridays from December to April. A beautiful forest road leads us to Agros Village, where we will visit a sweet factory, here you will have a chance to see how the natural sweets like sudjoukou and jams are made. Next, we will visit the famous rose factory, where excellent Rose Water and Organic beauty products are made using traditional Cypriot methods. We will then visit the Church of Agios Nikolaos tis Stegis, which was included on UNESCO World Heritage List in 1985. It is the only surviving katholicon (monastery church) of an 11th century Byzantine monastery in Cyprus. It is amazing to see this entirely painted church. We will continue our journey to Kakopetria Village, where we will stop for lunch in one of the village restaurants where you can try home cooked dishes. Lunch is optional and is not included in the price. There will be free time to explore this old and interesting village. Last, but not least, we will visit one of the largest waterfalls on the island Millomeri hidden Waterfalls, after which we will stop for wine tasting at a local village winery before hiccupping home. This excursion runs on; Friday from May to November. and Thursday from December to April. & indulge in a swim at the Blue Lagoon! Our journey will begin with a visit to the mythical birthplace of Aphrodite – Petra tou Romiou. We then continue to the Akamas Peninsula, where we will visit the Avakas Gorge – a natural wonder with limestone walls up to 30 meters tall. Here, we will stop for a walk deeper inside, to experience the breath taking views of this natural beauty. Afterwards, we will drive off-road to the famous Lara Bay, known as the breeding ground of the Green Turtles of the Mediterranean. The Cyprus Government was one of the first in the Mediterranean, to protect the turtle population and beaches where they nest. Arriving at a beautiful botanical garden, we will visit the Baths of Aphrodite - a natural grotto, filled with spring water. There will be time to have lunch at a nearby Cypriot family restaurant with a spectacular sea view. At the Harbour of Latchi, we will board the boat for an exciting trip of sightseeing, relaxation, and swimming. We will visit the famous Fontana Amarosa or the Fountain of Love, which is said to bubble with the Goddess Aphrodite’s fabled love potion. Then we will stop at a most popular bay in Cyprus – Blue Lagoon, with its beautiful white sandy bottom and blue crystal waters. Here you will have time for swimming, snorkeling and relaxation. Experience true Cypriot Village life on this exciting trip for the whole family! A beautiful countryside road through little villages and splendid views will take us to the donkey farm in Apesiá Hills – one of the most unspoiled and natural areas in Cyprus. Enjoy the fresh air and hillside views, as well as have great fun and laughter riding your donkey! (optional). We will then visit the non-touristy village of Kapileio to get a glimpse of the traditional way of Cyprus life. Our exploration will continue with an exciting off-road drive with magnificent panoramic views. Our next stop will be in Laneia – a picturesque village at the foot of Mount Troodos, one of the country’s still wine producing villages. We will walk through the beautiful flower lined streets and stone houses and visit an ancient and authentic Linos – a wine press formerly used for making legendary wine Commandaria. We will continue our drive to Troodos Mountains, where we will stop for a walk inside the beautiful mountains, at one of the highest waterfalls in Cyprus Kalidonia Waterfalls. After, it will be time for lunch at a traditional mountain village restaurant. Finally, we will visit a local winery to taste the splendid wines, famous in the region. entertainment in true Cypriot style! We visit a traditional Cypriot tavern located on the narrow streets of Kouklia village, in the district of Paphos. You will be served a Cypriot Meze, which is the best way to sample some of the tastiest local foods! Indulge in a variety of mouth-watering small dishes served "seega-seega" or slowly-slowly, throughout the evening. Your food will be accompanied by local village wine and a selection of soft drinks. You can eat as much or as little as you like and enjoy an amazing show of folk dancing and live music performed by local Cypriots! Be prepared for a relaxed evening full of fun and dancing, which is an important part of the island’s culture!